Authors and researchers wishing to showcase their work at UbuntuNet-Connect 2017 now have up to 31st August 2017 to submit abstracts to be considered for presentation at the conference. 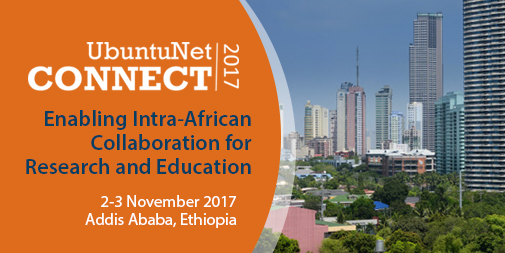 UbuntuNet-Connect 2017, the tenth of the series of annual conferences of UbuntuNet Alliance, will be held on 2-3 November 2017 in Addis Ababa, Ethiopia under the theme: Enabling Intra- African Collaboration in Research and Education. The conference will be co-hosted by the Ethiopian Research and Education Network (EthERNet) in collaboration with the African Union Commission for Human Resources, Science and Technology. Prospective authors were initially called to submit their abstracts by August 11, 2017 but the Alliance has now extended the deadline to give researchers ample time to work on and submit their abstracts. Interested researchers and authors are being called on to submit abstracts of not more than 500 words focusing on the conference’s outlined themes or any topic that is relevant to research and education networking. Abstracts should be submitted online by creating an account on the conference’s platform. A full Call for Papers is also available online.